Arthur George Partridge was born in 1880 at Hardington Mandeville, Somerset, the son of labourer John Partridge (b1855) and Charlotte née Delamont (b1854), both of Hardington. In the 1881 census John and Charlotte were listed in Hardington with their children; Jane (b1875), Albert (b1876) and one-year old Arthur. The family were still in the village in 1891 but with four more children; George (b1882), Elizabeth (b1884), Sydney (b1886) and Percy (b1887). Both John and 11-year old Arthur gave their occupations as labourers. In the winter of 1899, at the age of 19, Arthur married Lucy Ellen Sims (b1878, Newport, Wales) at Yeovil. They set up home at 34 Great Western Terrace and were listed there in the 1901 census with their four month-old son Wilfred. Arthur gave his occupation as an Assurance Agent. Arthur and Lucy were to have another child but I could not trace them in the 1911 census. They did, however, move to 27 Camborne Grove at some stage. Arthur enlisted at Taunton in January 1915, joining 8th (Service) Battalion, Somerset Light Infantry. His Service Number was 16971. The 8th (Service) Battalion was formed at Taunton on 20 October 1914 and came under command of 63rd Brigade, 21st Division. The battalion, including Arthur, went to France on 10 September 1915, landing at Le Havre. Following the Battle of Loos, the 21st Division suffered over 3,800 casualties and took the rest of the year to rebuild. As winter set in the intensity of fighting lessened somewhat although the landscape remained extremely dangerous and day-to-day fighting in the trenches took a tremendous toll on both sides. At the end of January 1916 Arthur was caught in the blast of a shell exploding near him. 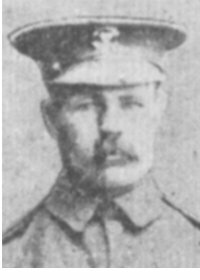 Although "affected by the shock of a shell falling near him; he was not hit in any way, and was conscious to the last" nevertheless Arthur must have sustained serious internal injuries from the blast as he died on 27 January 1916. In its edition of 11 February 1916 the Western Gazette reported "Another Yeovilian to meet his death in action is Private AJ Partridge, who is reported to have died on January 27th from shell shock received whilst serving in the trenches with the 8th Somersets. His widow, who resides at 27 Camborne Grove, and is left with two children, has received many letters of sympathy, including one from the Wesleyan chaplain, who officiated at the burial of the deceased, and one from the late Private’s comrade, both of whom pay warm tribute to his conduct in the trenches. Describing how the deceased met his death, the Wesleyan chaplain said that he was affected by the shock of a shell falling near him; he was not hit in any way, and was conscious to the last. The late Private Partridge gave up his employment at Messrs. Lock’s to enlist in January 1915, and went to the Front in September of the same year." 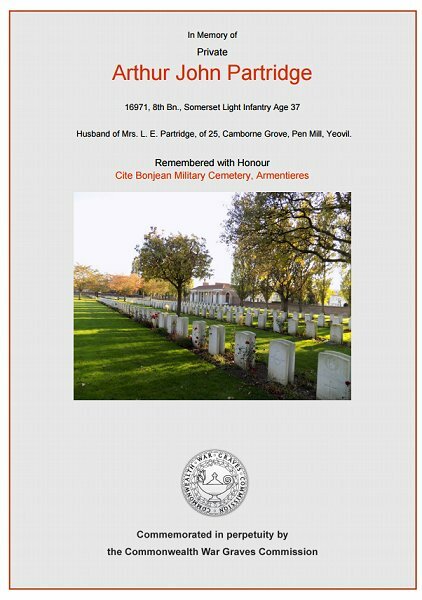 Arthur Partridge was interred in Cite Bonjean Military Cemetery, Armentieres, France. Grave IX.E.52, and his name is recorded on the War Memorial in the Borough. The Commonwealth War Graves Commission certificate in memory of Arthur Partridge.